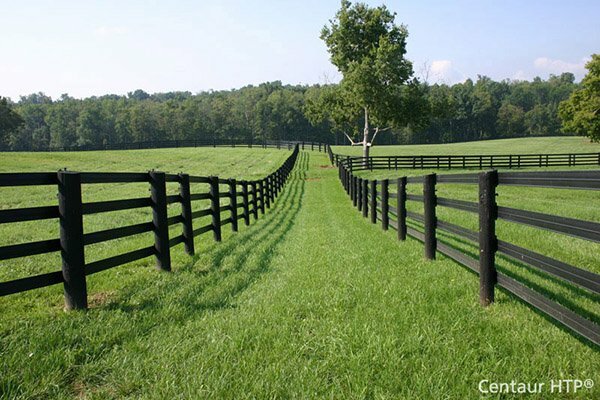 Hoover Fence Chain Link Temporary Fence Panels | Hoover Fence Co. Temporary Portable Chain Link Fence Panels & Barricades - Hoover Fence Company provides premium quality fabricated temp fence panels that are hand crafted from start to finish. Our panels are guaranteed to please and last! All panels are constructed using conventional techniques (tension bars and tension bands on the left and right, tied with tie wires top and bottom) and prime materials. Our system provides easy set-up and tear-down to save you time and money! The temporary fence panel's ends slip over the uprights of the panel stands, and fasten together at the top with saddle clamps to provide a free-standing fence line of any length and configuration. Temp Fence Frame constructed of galvanized 1-3/8" diameter, .065 wall tubing. 11-1/2" gauge galvanized fence fabric with 2-1/4" mesh. Aluminum tie wires used for securing fabric to fence frame. All fence panel and gate corner joints are welded and sprayed with a galvanized paint to cover any exposed metal. Chain Link Panels come in 4 standard sizes measuring 6' high and 8', 10', 12', or 14' wide; custom sizes available. Variety of widths give you flexibility upon installation. Other sizes, grades, and options are available on a per quote basis. Available with different bracing options. See Drawings Below. Stands made of same 1-3/8" diameter tubing with slightly smaller uprights for panels to fit over. Please note that we can provide a more economical panel using lesser quality tubing and chain link, typically laced on all four sides. This budget friendly style is available on per quote basis for truckload quantities. Light weight 'loose' chain link fence materials are also available for use as temporary fence. Plus Bracing - These panels feature both vertical and horizontal bracing and are the most durable panels we manufacture. Vertical Bracing - These panels feature an added vertical brace (centered in frame horizontally) which increase the strength and durability of the fence panel. No Bracing - These panels do not have any internal bracing. 6'H x 8'W 60 lbs. n/a 45 lbs. 6'H x 10'W 68 lbs. n/a 50 lbs.